Each cottage is divided into 3 separate accommodation units. On the ground floor of the house there are separate 2 double rooms with private bathroom (some with the possibility of extra bed), balcony, refrigerator and own covered parking space. From the back of the house are stairs to the family suite, where there are 2 separate bedrooms, bathroom and terrace. Parking space is in front of the house. Thus, the brick house can be used by group of maximum10 persons or independently by 3 families. There are NO KITCHENS in brick houses, only Standard suites *** for 5-6 persons have a fridge and microwave, kettle and basic utensils. 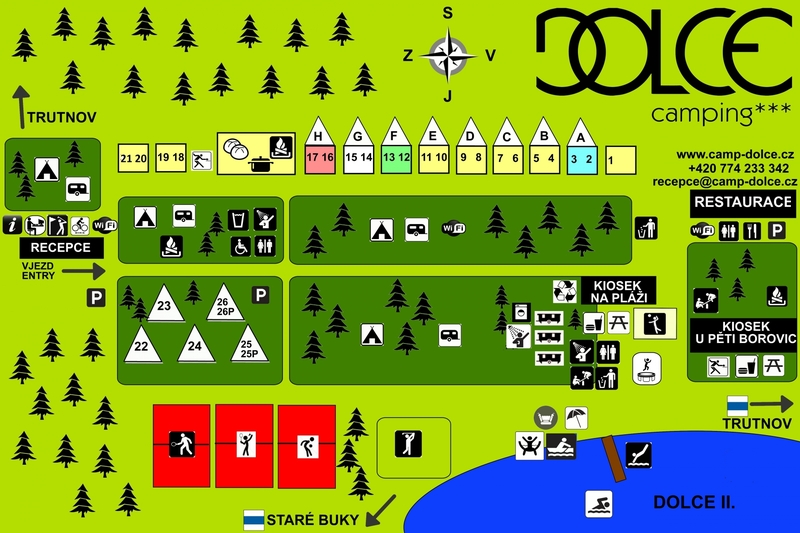 Plan of holiday homes here. Accommodation price/ night 3. 1. - 20. 6., 1. 9. - 20. 12. 21. 6. - 31. 8., 21. 12. - 2. 1. Accommodation price/ night 3. 1. - 20. 6., 1. 9. -20.12. 21. 6. - 31. 8., 21. 12. - 2. 1. Children under 3 years - free of charge without bed. Prices include one car parking, bedding and electricity. Prices do not include a recreational fee of 12, - CZK / person 18 + / night.